Leading bed manufacturer, Askona signs exclusive deal to bring world’s first adjustable line of mattresses to the Russian market. The world’s first fully comfort-controlled mattress line featuring a choice of spring, foam and air support with built-in technology to control individual comfort, from ultra plush to ultra firm. I’m always looking for something exciting when coming to these shows. iSleep Sense is a vibrant, cutting edge brand and I’m anticipating that our customers will love having control over their comfort, on both sides of the bed. Sleep health technology trailblazer iSense Sleep kicked off the 2018 Las Vegas Furniture Winter Market by signing its first international licensing deal with the leading mattress brand in Russia, Askona. With over 53% of the market share and 950+ stores, Askona now holds the exclusive ability to bring iSense Sleep’s Comfort Control ™ technology to the Russian market. 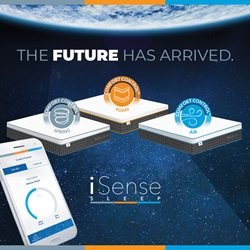 iSense Sleep offers the world’s first fully comfort-controlled premium mattress line featuring a choice of spring, foam and air support with built-in technology to control individual comfort, from ultra plush to ultra firm with the touch of a mobile app. After years of research and realizing that meeting comfort needs is more important the day after you purchase a mattress than the day of the purchase, VariCoil ™ and VariFoam ™ were pioneered. They are the first ever air-assisted technology that does not interfere with the bounce- like qualities of spring or the hug-like feel of foam beds, and are uniquely engineered to provide a full range of Comfort Control™. For 95 percent of the market today, the mattress buying experience consists of laying on a bed for 10 minutes in front of a salesperson and it ends with the consumer taking home an unchangeable, static mattress. “The iSense Sleep line will change the mattress buying process and give consumers the ability to control their comfort after the sale. This will have a profound impact on this industry, and peoples' lives.” states Paul Longman, Founder and CEO of Advanced Sleep Technologies, the company behind the iSense Sleep brand. iSense Sleep is the debut mattress brand offered by Advanced Sleep Technologies, a company dedicated to improving sleep health. The iSense Sleep comfort-controlled mattresses will be available in three configurations: Spring, Foam and Air. All are premium mattresses and use a combination of industry-leading, American-made, specialty foams, fabrics and individually wrapped ComfortCore® steel springs. Every bed features a uniquely designed edge support system providing maximum side and corner support engineered with optimal flex when used with an adjustable base. Each mattress has a removable, zippered cover that provides easy access to any of the interchangeable components. The company will also introduce its SMART pillow and other bedding accessories including the Contour® adjustable base. For more information visit http://www.iSenseSleep.com or visit their booth at the Las Vegas Furniture Winter Market, A938.